On an August morning in 2006, two structural engineers in tool-laden safety harnesses rappelled down the facade of Gasson Hall’s 195-foot clock tower. The workers carried computerized writing tablets preloaded with blueprints and structural drawings, on which they recorded the masonry’s condition: cracks and missing slivers, crumbling mortar, stones worn smooth by the elements. The near century-old building, their work revealed, was in need of a major restoration—a projected six-year process requiring, to begin with, the deconstruction and restoration, stone by stone, of the tower’s spires. In April 2007, chain-link fences rose around the building’s perimeter, and the tower was cocooned in a sheath of green mesh netting and metal scaffolding; by August, the tower stood roofless at 155 feet—a height it will likely maintain through the winter and spring while workers replace its decorative stonework—in what may be one of the largest stone restoration projects underway in the nation. Since Gasson Hall was built in 1913, it has been a symbol of Boston College, its spires looming above the treetop canopy, its four brass bells, the largest weighing half a ton, marking time in F, B-flat, C, and D (encased in plywood, the bells remain in the tower as work goes on around them). 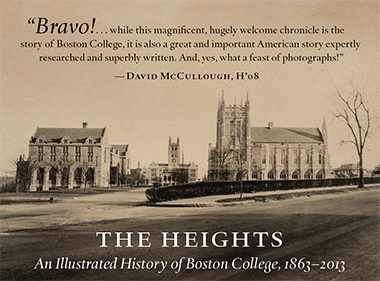 Commissioned by University President Thomas Gasson, SJ, the founder of the Chestnut Hill Campus, the English collegiate gothic–style building was the first to rise on the newly purchased land, formerly a sprawling private estate with panoramic views of Boston, the Blue Hills, and the then-undeveloped countryside of Newton. Originally called the Recitation Building, and later, the Tower Building, it was conceived by the architectural firm of Maginnis & Walsh, which went on to produce 13 buildings for the University of Notre Dame. The design was selected by competition, and envisioned as part of a grand campus of 19 companion buildings situated to form a cathedral-like shape, with Gasson Hall set at the junction of nave and transept. Shifting budgets and tastes resulted in only four structures being built from the plan: Gasson, St. Mary’s Hall, Bapst Library, and Devlin Hall. Once a fully contained university with locker rooms, laboratories, and a cafeteria, Gasson is now home mostly to administrative offices and classrooms. Its gray Roxbury puddingstone exterior has weathered well, says the University’s construction project manager, Jake Mycofsky, but many of the stones on the trim, tracery windows, and spires—primarily cast stones made of a poured concrete mix of sand and crushed rock—have worn down over time. Once light-tan and textured on the surface like corduroy, says Mycofsky, their top layer “has been battered by the elements,” exposing the dark-colored aggregate used in the original mixture. Core samples, lab tests, and months of analysis have revealed a pattern of cast-stone failure invisible from the surface, and show that much of the mortar holding the masonry together has begun to disintegrate and recede. More than 2,500 cast-stone pieces on the spires, crenulations, and structural and ornamental components must be removed, measured, and recast.